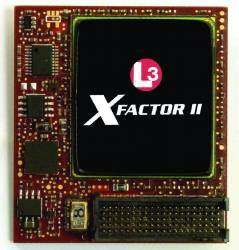 L3/Interstate Electronic Corporation (IEC) has scored a key contract win with today’s (March 17) announcement of the company’s selection by Alliant TechSystems, Inc. (ATK) to supply IEC’s new TruTrak Evolution GPS receiver for the Army’s Precision Guidance Kit (PGK) program. The XM1156 PGK Program, managed by the Army’s Combat Ammunition Systems at Picatinny Arsenal, New Jersey, will replace a “NATO standard” fuze on existing stockpiled artillery ammunition. According to the PGK program manager, Russell Hill, PGK technology can be applied to literally millions of existing 155mm and 105mm projectiles that are used by howitzers and towed artillery pieces. IEC’s TruTrak Evolution (TTE) is a gun-hardened, miniaturized GPS receiver designed for incorporation into the fuze well of munitions to provide positioning data for the guidance system. The P(Y)-code receiver incorporates IEC’s SAASM (Selective Availability Antispoofing Module) technology. 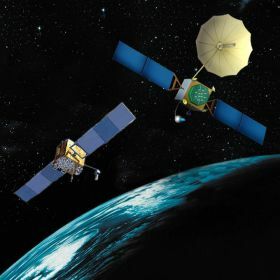 The PGK design combines a proprietary aerodynamic steering technique with an extremely small system implementation allowing the guidance system to be incorporated into the space traditionally set aside for only the fuze subsystem. In May 2007, ATK received an initial 18-month, $18-million system design and development (SDD) contract from the United States Army Armament Research, Development and Engineering Center (ARDEC) to proceed with development of the company’s PGK. ATK received the contract following a multi-day, competitive shoot-off at the Yuma Proving Grounds, in Arizona. During the competition, ATK demonstrated accuracy better than twice that required, which is 50 meters CEP (circular error probable), according to the Army PGK program office. 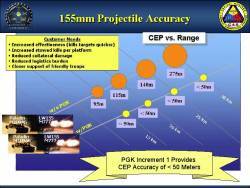 The ultimate XM1156 PGK program goal is to provide an accuracy of better than 30 meters CEP (circular error probable) at 30 kilometers. The PGK program has three increments, the first increment of which ATK has received the contract comprising three year’s production of upwards of 45,000 units intended for 155-millimeter high-explosive rounds. According to ALK, first PGK deliveries are scheduled in 2009. Future development contracts for Increments 2 and 3 will be awarded competitively.